Legendary remake by TDA finaly arrives in Carmageddon 1! The MoD is available for Unwheel, TDR2000, C2 and now C1. Maybe even for other games. Don't have much to say besides that ; Harm's script is still so great to work with. Download at the roadest of reactions! If there are Quake players among you guys, don't miss the freshly released Arcane Dimensions mod. I hijack this thread to post the releases of my C1 and C2 cars. I'm slowly getting fed up with addon cars and so I'd like to go through my todo list and be done with them to go on with level design. All these are already ingame but Coupe de Grace. Being able to wrap up the 2 first points up there would be amazing. Third point is definitely achievable this year too. What annoys me the most are the menu images. Especially the C1 grid icons urgh!! 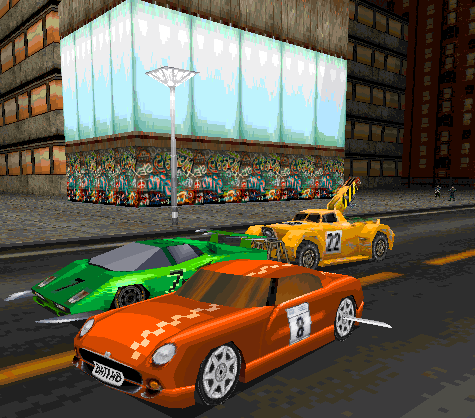 Ah and I still have to properly release the cars I worked on for Razor's beta mod. In the meantime you can find them there: cerby, digga, monsterbug, icevan. I wanted to put it out right after the GHIA on monday, but hey. Drives a bit stiff. Available at RR2000 ; refresh the page if it doesn't appear. When making the menu pics, I understood this car was from the tv show Ben 10. So I guess this is one for the little ones? Car looks kinda good though. Had to make it orange as C1 hates green. Next one is FlatOut2's Venom. These are looking great. You're really cranking these out like a man possessed. The derp version of the Stiletto, based on a drawing by Agent Orange. I thought I had released the C2 version long ago, but actually nope. So here's a version for C1 at least. A joke addon really. Somehow the C2 version works better, I'll put it in the R6 folder. Heh, teh stelltio is just a joke but I like it :) Original drawing here. Took me a little more time as I wanted this one to be good. I'm really glad with the thruster effect. So this concludes the first step as established in my second post up there. Next will be the 7 BRoom cars I think. I won't put as much effort in them as they are more for the show. sweet man, keep up the good works! Wow, so much cars to test :) BRoom cars? Great!!! Here are the seven vehicles from the "BRoom!" gamelette made by Stainless before Carmageddon 1. They are very old ('95) and were made by nobby. I can't say they are very interesting C1 cars, but some were definitely prototypes (MINI, PORK, LAMB). I guess ROLL inspired the Lead Pumper and VIPER might have served as a base for Cleaver? I guess the next one is the Crazy Taxi car. Thanks for finally getting these in the game! As long as you replace the engine sound with some rad Offspring song that's full of 'tude! Those look really fun, dashboards and all. Nice video too! Slash's Eldorado, from Crazy Taxi 3, for Carmageddon 2. This is Slash and his car from Crazy Taxi 3. The car is a kind of mish mash based around a 1957 Cadillac Eldorado Brougham. While the addon is not very interactive C2 elements-wise (few detach, smash, no flaps), the model is kinda good looking and handles quite well. I used that full lit trick from the previous Eagle MK4 and also that diffuse-color-on-washed-out-texture like I did for the Razorback 2013 to make the yellow paintjob a bit more shiny (doesn't show well in that screenshot up there). Someone call for a taxi? Nice conversion, really slick looking...and that hair! Thanks for testing! And yes, he's mister fancy-hair-from-the-late-90's! Tested Harm's vertex picking script and it works great. Can't wait to be able to add rudimentary crush datas! It's ofcourse at RR2000, and don't forget to refresh the page if it doesn't appear. Next one should be Coupe de Grace, though it'll come a bit later as I have less free time. Can't wait to be able to add rudimentary crush datas! A whole bunch of stuff here to screw around with toshburger. Also I did a diffrent more subtle higher res interior.. ya. I have to ask tho tosh, How did ya do the windows that are transparent from interior view but solid otherwise? and im gona have to try out some of that C1 stuff. 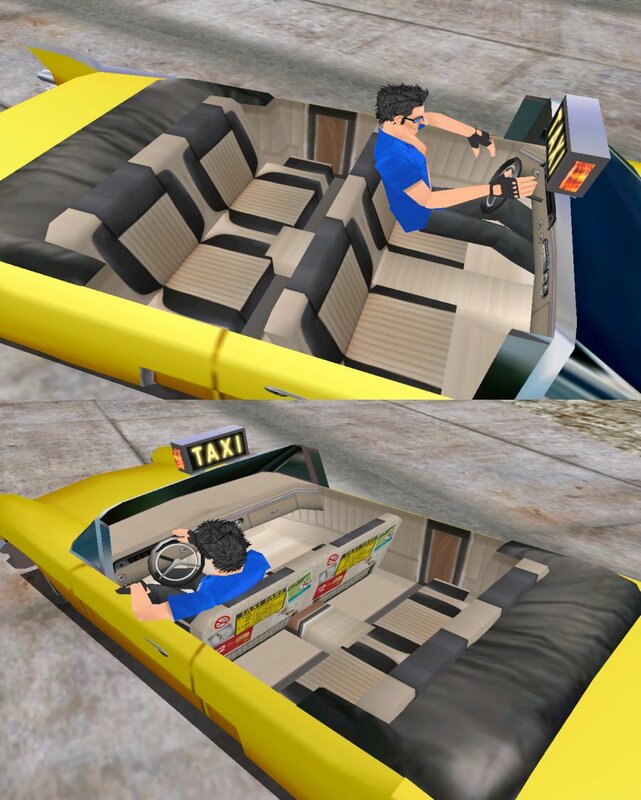 At first I had cut doors out of the crazy taxi model, then thought 'let's just stick to what's in the original game'. Nice interior! Transparent materials in interior view are set via the CAMERA_TURN_OFF_MATERIALS keyword at the end of the text file, I think I explain how it works in the comments of the Eagle MK4 text file. Just like the Cerbera, I spent a lot of time drawing pixels and swapping colors on the textures. I really like it! Unlike the Jetcar, I kept most of the C2 look but for the front grill and suspensions which I restored from CWR's original design. I think I'll add the suspensions to the VanillaC2 version too. Applied the dither flag on the roof texture to good effect but had a hard time getting it to work until I figured the texture had to be at least 64x64! Anyway, you can get it at RR2000 (refresh if it doesn't appear, also I'm changing server in the upcoming days so there might be a downtime or older versions of the page might appear). That interior looks like it came straight out of the original game. Toshiba-3 wrote: Thanks for testing! And yes, he's mister fancy-hair-from-the-late-90's! I actully liked the green Cerby. Sadly i think i lost it some point in time. Although this one is more Carma related . EDIT : Never mind, i found a 'Just in case' back up . Last edited by The Joker on Thu May 31, 2018 4:51 pm, edited 1 time in total. Had a little fun with the characters, alterning poses between the shell and complex model. 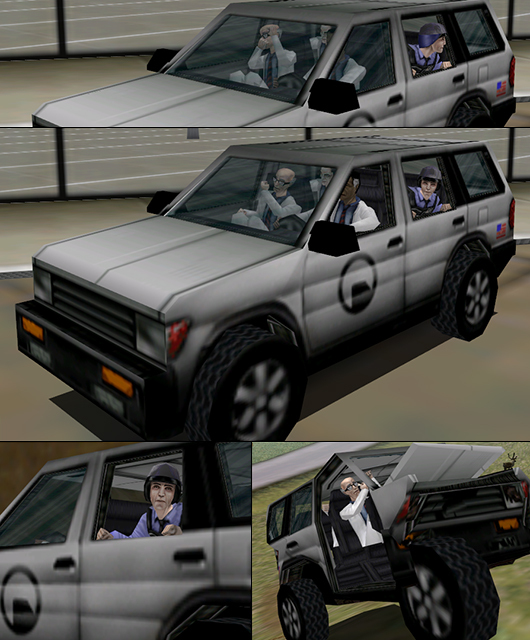 The car model is almost extracted from one of the Blue Shift levels (it was a brush, had to clean the model afterward and cut doors). Original character models were prefered over the "HD" to save on polys, but it still came with a lot of textures. No particular trick or feature, just the Black Mesa scientist team engaging into a Carmageddon race! Download it at Road Reaction 2000 as usual! Hey I couldn't remember that SUV but it is shown at the end of Blue Shift? It really shows how texturing has improved over the years. These textures are so toon-ish looking, heh. Ever get around to doing anything with those models I sent you a few years ago? Maybe I should get back into it and finish something myself?! Also, Hi guys! Don't worry, I'm still around and never managed to make anything of myself! I've smartened up to the extent that I've realized that starting a family is probably the most important thing you can do, but financially and in terms of resposibility I'm still where I was in the early 2000's! To the extreeeeeeme! Besides the E1M4, I don't remember you sending models my way..? E1M4 is still on the todo list, not yet decided between putting it in C1 or C2 though. The only unreleased model that comes to mind is this one. Only the cockpit left I guess? Harm: Yes, it appears now and then in the original HL1 and both expansions. Besides the texture quality, it's especially surprising how unoptimized the mapping is. A lot of bitmaps for a low detail model, separate bitmaps for barely visible parts, similar maps (legs, arms etc) not sharing the same bitmaps. Also they aren't power-of-2-sized, probably because they were made at a moment were on the software renderer was considered, but then the direct3d and opengl modes at to upscale them. Not improving texture quality either.